My son is walking the streets of Oxford with hundreds of other students who are protesting against the Oxford Union’s decision to allow Holocaust revisionist David Irving and Nick Griffin (leader of the BNP) to address students tonight. Unlike most of his friends, who are protesting against the decision, my son thinks they should be allowed to speak. It is a difficult position to maintain. He is nominally a member of the Jewish Society who have written an impassioned letter on behalf of their members, one which probably reflects the views of most of them, but not my son, who thinks that there is a frenzy being whipped up which is preventing people from thinking. Me, I don’t know what to think about it, or I change my mind hourly. I think there are intelligent and moral reasons why they should not be given space to put their views, that these things can't be separated from the real world and made to look as though it's all ok and legit, even though the subject is Free Speech. On the other hand, I regret the fact that the people who might have spoken against them have withdrawn – that an opportunity may have been missed. And what with one thing and another – death threats to students from neo nazis – I am hoping that things don’t turn nasty. I have just spent half an hour cleaning up after a glass bottle smashed onto the terracotta tiles of my kitchen floor. The bottle was in my fridge and contained I don’t know what, but it smelled of some vile concoction of vinegar and herbs (and something medicinal) and must have been there long enough for me to have forgotten about. It was one of those things that take up residence and stay for so long that one just doesn’t see them any more until they jump out of their own accord. Picking up the glass pieces and the nasty little splinters of glass reminded me of the word “shards” and how it is one of the words that is outlawed by the Poetry Police because, I suppose, it has been over-used. Of course, that might once have been enough to send me to the notebook to write the definitive Shards poem but now I have more pressing things to occupy me, such as looking at the dust particles on my living room window and trying to decide whether to wear socks inside my new Ugg Boots or just wear them like slippers, barefoot. I do in any case have the feeling that Shards is not one of those words that I feel moved to redeem. I remember a letter I received many moons ago (reader, that was deliberate so don’t be thinking you have caught me out) from an erstwhile with whom I had broken up. He had once given me a tulip made of glass, a lovely thing that unfortunately broke during a flat move. In the letter, he said of our relationship that it was like “gripping the shards of a broken tulip: once it was so beautiful but now it draws blood.” Even then, I had a sense of the naffness of this and couldn’t help identifying the two culprit words (beautiful was the other) that weakened what may have been a nicely compelling image, even if a bit overblown, to round off a relationship that had, to coin a phrase, gone some distance past its sell-by date. I am rallying from what has been, so far, a challenging autumn. I am perhaps unusual for a PWME in that this is often my best season, but it has not been so this year. There may still be time to gather something, though. I have spent a week with a good friend from Poland who has been happy to tune into the variable rhythm of my days as it represented a rest and a refreshment from her usual relentless busyness. We also went out for poetry, music and theatre. Saw The Giant by Anthony Sher at the Hampstead Theatre which you can read about here and here. I particularly liked the set and the costumes but came away thinking that there had been too many words, and wondered if this was a reflection of my energy levels or whether it really would have benefited from more editing. It’s sometimes difficult to assess. I have been honoured and bestowed with a Shameless Lions award for "Powerful Words" which I am proud to add to the collection of trophies on my sidebar, particularly as it comes from House of Pants whose lovely poems I have just been reading in Obsessed With Pipework. Funnily enough, I had just decided to subscribe to this on the strength of the name alone, before I even knew that House of Pants was in it (and hers are the first three poems). This is, of course, a Sign – of what, I don’t know and really, one can’t be expected to do everything. Reading the signs does not necessarily mean interpreting them (though I do sometimes have a stab at it). Enough just to know a Sign when one appears, and to trust that all will unfold in the fullness of time. But where were we? Roaring words. I haven’t made so much as a squeak on the blog for a while but have been bleating elsewhere, in shocking pink notebook to be specific. Being somewhat more than usual energy-challenged, I’ve only had the wherewithal to do one or the other, and the other won out. But don’t think I haven’t missed you all or that there haven’t been loads of things I’ve been telling you – in my head, that is. 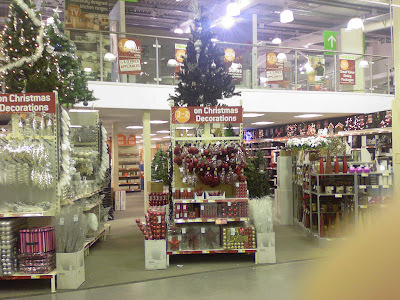 Just to prove that this is true, here is a snap from a recent trip to Homebase. I was having another Stepford Wife Moment and thought, I must show them this. I had so much to say about it too but you’ll just have to take my word for it and try and imagine what it is I had to say because it’s all gone now – wiped. That’s what happens if you don’t get the words out quick as they come, you see. They bugger off. All I know is that at the time – Wednesday evening of last week, to be precise (which for some unaccountable reason I feel it behoves me to be) – I had returned to Homebase with one of their standing lamps that was so hideous when unboxed, and so defiant of being assembled into anything resembling the picture on the box that decided I could not give it houseroom for one minute longer. I looked at the Christmas tinsel and the lights, took in the fact that I was the only punter in the store and was brought to my knees. Take me now, I said to no-one in particular, but there may have been an angel at my side and you can see the brush of its wings in the bottom right hand corner, or I may have been struck by a combination of unearthly fatigue and opioid prescription drugs. Reader, no-one came. So I stood up, got a bag full of slow-burning tea lights and lived to do another blog post. I was looking at the word “virus” the other day and realised that I didn’t really know what it is. I use the word virulent a lot to describe something that is aggressive, unpleasant and destructive. I think of it as something alien and unfriendly to the place it comes into. My body behaves as thought everything is a virus and must be fought with all the resources it can muster. I am a poor country always at war. The army has taken over and has held the country in its grip for many years. It cares nothing for the land or its people. It cares only for war. At this very moment it is calling on its demented soldiers to fight against this activity of tapping words onto a screen. My mother called me the other day. It was a bad day, I was struggling to remain upright, the army has perhaps got wind of plans afoot to take back the land and is fighting with all the weapons at its disposal. “Oh no, we don’t eat.” She does, of course – big meals, roasted meats, organic vegetables, cake and wine and cheese and fruit. And just as well, really. I have been reading about people who give up all food and drink and claim to live on air and light alone. They might take a bite of something like celery or chocolate, just to experience taste or texture, but they don’t eat as such, or drink. I am engaged by the idea of living on light. Can’t help wondering, though, how this would work if one lived in, say, Finland, where it is pretty dark all through the winter. A woman was quoted as saying that she had the sense that food was somehow poisonous to the system and that breatharianism could and should be achievable. Consider: there would be no shopping to do because no meal times. No breakfast, lunch, tea, supper, snacks. Nothing to offer people when they come to visit but the light from your windows and, presumably, yourself (for you would be existing at a much higher vibration). You would be, I suppose, like the angels. No need for toilet paper because with nothing going in there would be nothing to come out. And appetite all gone. What about the companionship that comes with sharing food? The word companion has the word bread in it. It is a person with whom you break bread. We don’t just hunger for something to fill us up but for everything that earth can give here and now, while we breathe in it, which includes turkey with trimmings, flaming pudding with spiky holly on a white plate, crunch of toast just burnt at the edges. I picture sitting around a table with people I love or wish to know better: I have no food to offer you, just my breath and my words. And to my mother I would say: “well, here is a table full of light, then. Have that.” I don’t think so. No, it wouldn’t suit me at all. I have just eaten a baked potato with grated farmhouse cheddar, leek and chive sausages and broccoli. I think that one gains a certain hold on life by relishing and eating them. Labels: food, light and darkness, m.e. It is a dark and stormy night and I thought it was time to put up another blog post. Why this should be I can’t quite say as nothing remarkable has happened in the world of Signs or, at any rate, nothing that I would care to properly identify, though I should perhaps mention that the poet Collin Kelley, who I invited to a Poetry Café at Lewes Library, gave a splendid reading last Friday, even though the number of people that showed up was disappointing, and this in a town so chock full of poets you can hardly move for bumping into them. But no matter – the ones that did come were glad to be there. I have a silence in my head. I am not sure whether I want to hear something or not: on the one hand it is disconcerting to drop a stone into the deep well of the mind and find that there is no splash, no echo; on the other hand when the sound that comes back is not a splash but a strange sound that makes one back away from the edge, the silence is not necessarily such a bad thing. I am not in the vein to meet Grendel or his mother. I have been re-reading bits of Jack Kerouac’s On The Road and find I am still carried away on the sheer energy of the writing as he (whoever) travels from east to west and from north to south, hitch hiking, scrounging petrol, drinking, smoking. It is the progenitor, I suppose, of all the road movies and strongly romantic. There is something about the beat writers and their lives that has always drawn me, a vicarious pleasure I get from the vitality that drives them – perhaps because I myself have never been what is called “robust”. I have signed up to do a certain Process in December to see if I can bring about a change in my long-standing Condition. You will notice how coy I am being about naming anything – this is because I would rather not draw a host of desperate, hopeful or angry googlers; there has been much heated debate about the various Processes currently around that are meeting with varying degrees of success. There seems to be a belief that it may be possible to reprogramme oneself, or at any rate the hypothalamus, so as to bring about extraordinary changes in the body’s responses. I have nothing to lose but a few hundred pounds. When I told my mother that she thought I was planning to go on some kind of crackpot diet – in which case it would have been a story of the incredible shrinking, not to say disappearing, Signs. And I have no intention of doing that – yet.